2018 – Let’s Create Beautiful Things! March 16 – Charlotte, NC CONFIDENCE (and The Speech), written by Susan Lambert Hatem, is a unique, gender-bending political play about confidence, women in politics and President Carter’s 1979 Crisis of Confidence speech. Come to the reading March 16 with Charlotte’s Off-Broadway and their PAGE to STAGE series. We are in talks with COB for a workshop production for Fall 2018! April 13 – 22 – 134 West is proud to join with many theater producers around Los Angeles to produce one of many HomewardLA events, a 10-day citywide event where multiple productions of monologues based on stories from people who have experienced homelessness will be performed by actors all around the city. HomewardLA’s goal is to increase awareness around the homeless crisis facing Los Angeles and raise funds for The Midnight Mission, a great nonprofit organization on Skid Row. We think it’s also having a neat side effect of bringing #LAThr people together. Ty the Pie Guy – Wow! We’ve streamed almost 3 million minutes of Ty the Pie Guy episodes to over 1 million unique viewers across Amazon, YouTube, Facebook and other platforms! Thank you to our fans who continue to inspire us and send us photos and videos of trying Ty’s recipes. Great news! Ty Freedman and Susan Lambert Hatem have finished a draft of the Ty the Pie Guy screenplay. That’s right. We’re working on a Ty the Pie Guy movie! 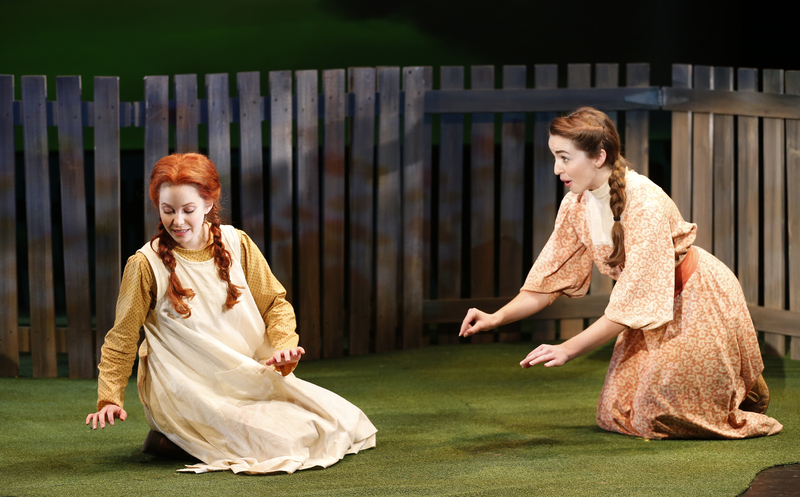 Bend in the Road: The Anne of Green Gables Musical – After a fantastic workshop and reading with Children’s Theater of Charlotte last summer and some script updates, we’re excited do a full production of this fabulous show! Reach out for more info. O Baby Mine: Sing a Song of Shakespeare LIVE! made it’s live concert debut at Joe’s Pub at the Public Theater in January to sold out crowds and great response! We were thrilled to work with NYC Children’s Theater on bringing Shakespeare music to children and families. Now, we’re developing the show further! We are proud to be attached to Twenty-Four Hours From Tulsa, written by wife and husband team artist Terry Holzman and cinematographer Ernest Holzman. Contact us to find out more about this beautiful ensemble screenplay set in 1968 that explores stories of friendship, love and four imagined days in the life of Dusty Springfield. We are currently looking for the right director(s). Reach out if you have interest. 134 West has so many fun and exciting projects in various stages of development. It has been incredibly productive year! We wish you hope and joy during the Holiday Gauntlet of Thanksgiving, Hanukkah, Christmas and New Year’s Eve! Go forth, make stuff. Be creative and joyful. 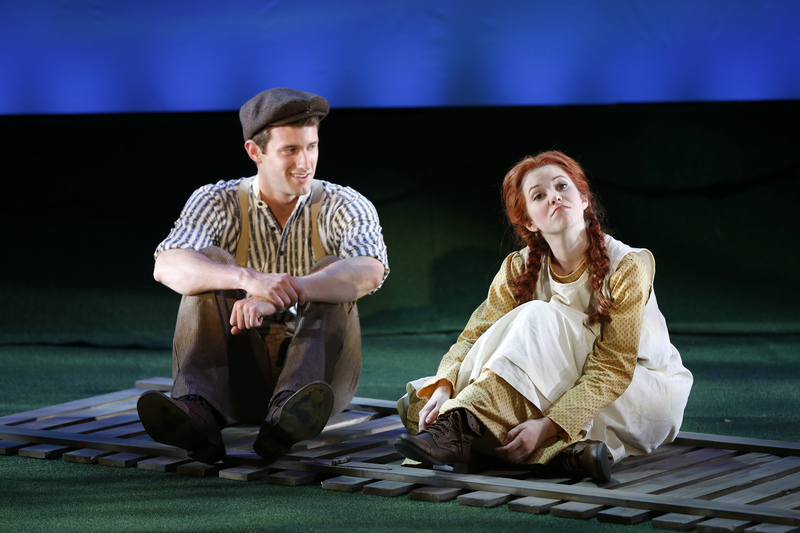 BEND IN THE ROAD: The Anne of Green Gables Musical – Thanks to director Michelle Long and Artistic Director Adam Burke for a wonderful workshop and reading at Children’s Theatre of Charlotte. We are now working toward a full production for 2019! TY THE PIE GUY – We are developing a feature and a new season of our award-winning kid show. Watch us for free on Amazon Video or YouTube! And we’ve passed over 2.2 MILLION MINUTES STREAMED of the Pie Guy videos! Stay tuned for more info. CONFIDENCE (and The Speech) – 134 West produced the first reading of Susan Lambert Hatem’s exciting new political play, CONFIDENCE (and The Speech) at Boston Court in May. And the second was a benefit reading November 8, which raised over $500 for Emily’s List and She Should Run. We are working with Charlotte’s Off-Broadway to produce a workshop and reading in 2018 in North Carolina. 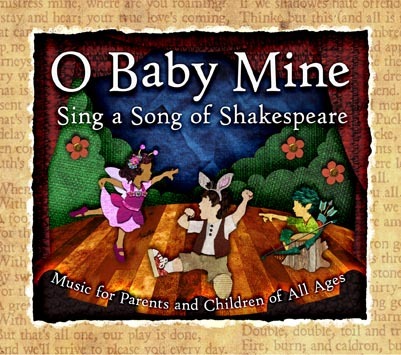 O BABY MINE: Sing a Song of Shakespeare! – SAVE THE DATE in 2018 for our special O BABY MINE concert at world famous Joe’s Pub! With NYC Children’s Theatre, 134 West presents this unique concert for children and families of special songs inspired by Shakespeare’s plays! Get your copy now! NYC Children’s Theatre concert at Joe’s Pub – Sunday, January 21, 2018 at 1pm – Sign up now! STRATEGY & CONSULTING: 134 West also specializes in marketing and entertainment. We consult with studios, agencies, schools and theatres. We are available for strategy and consulting and dramaturgy for special theatre and film projects. If you have a project and you’re looking for marketing, strategy and producing assistance, maybe we can help. Past clients include Charlotte’s Off-Broadway, AvatarLabs, Dreamworks Animation, Google and Disney. 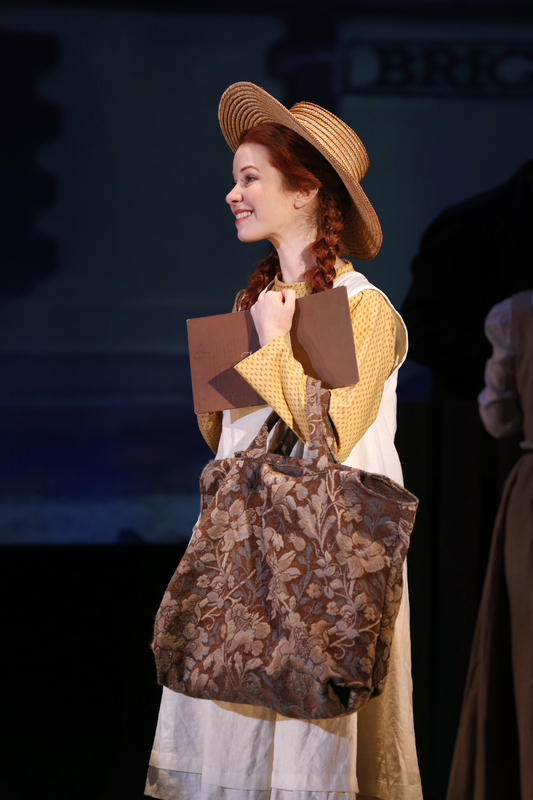 After a hugely successful run at The Pearl Theater on 42nd Street for the New York Musical Theatre Festival (NYMF), BEND IN THE ROAD: The Anne of Green Gables Musical is now looking for it’s next production! We are actively seeking theater and producing partners who are interested in a quality family musical that is both classic, inspiring and heartfelt with songs that send your soul soaring and stick in your head long after the show is over. 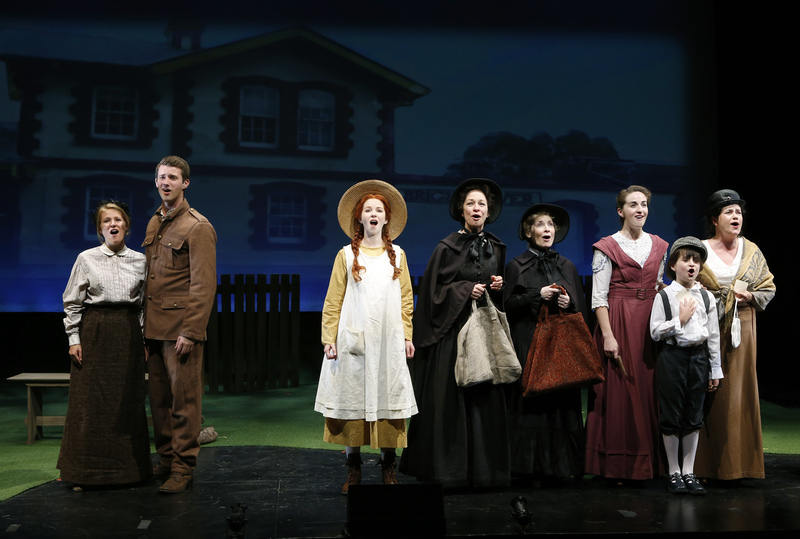 BEND IN THE ROAD: The Anne of Green Gables Musical is a fun and heartwarming family comedy musical based on the beloved classic novel, Anne of Green Gables, by Lucy Maud Montgomery. Bend in the Road tells the story of young Anne Shirley, an orphan, who is mistakenly adopted by siblings Marilla and Matthew Cuthbert to help them on their Avonlea farm. Anne’s intelligent, joyous and imaginative ways change the lives of all those around her in this small town, including Matthew, Marilla and nosy town gossip Mrs. Rachel Lynde. Anne finds fast friendships at school and a rivalry with classmate Gilbert Blythe turns complicated as they grow up. Photos by Carol Rosegg. 2013 New York Musical Theatre Festival. Songs for all the seven ages inspired by the bard! 134 West presents O BABY MINE: Sing a Song of Shakespeare, a new indie album of children’s songs and lullabies inspired by, and taken from, Shakespeare’s plays. 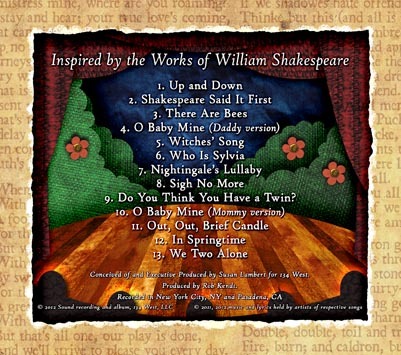 Producer/Director Susan Lambert conceived this new concept album when she adapted the lyrics of Twelfth Night’s O Mistress Mine to sing to her infant son while rocking him to sleep. 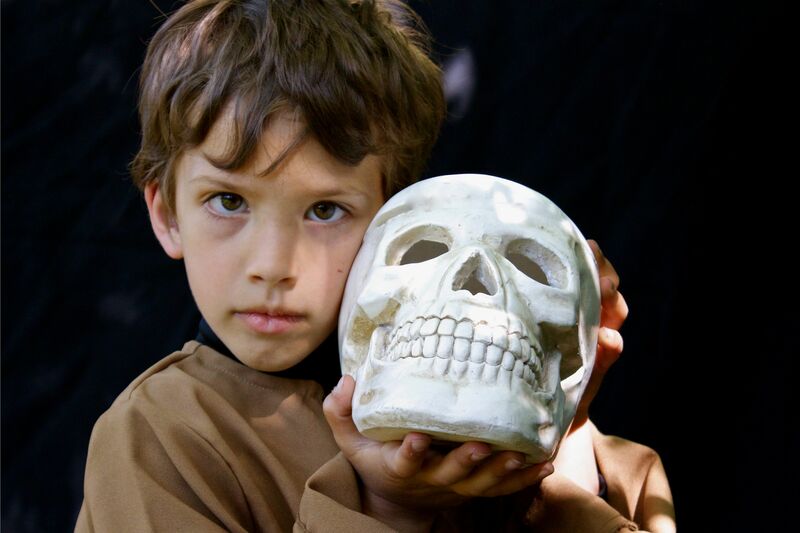 Alas, poor Yorick… Sing a Song of Shakespeare with O Baby Mine, a kid’s album inspired by Shakespeare plays. Executive Produced by Lambert. Produced by music and theater man-about-town Rob Kendt and featuring songs by Kendt, Madison Scheckel, Raymond Bokhour, Cinco Paul and many others! It’s a wonderful collection for smart and indie music loving families as well as theatre lovers and their kids. And, of course, for those who love the Bard, O BABY MINE is a wonderful way to share Shakespeare’s stories and words with all the seven ages. And the great thing is, this music isn’t just for kids or for Shakespeare fans. When 134 West produces family entertainment, it means everyone enjoys the fun. Head over to O Baby Mine website for more info and to listen to some wonderful songs. Explore the making of the album images and find some inspiring iconic Shakespeare moments re-enacted by kids. Shakespeare’s Twelfth Night set in 1938 Appalachia is a foot-stompin’ comedy with music! 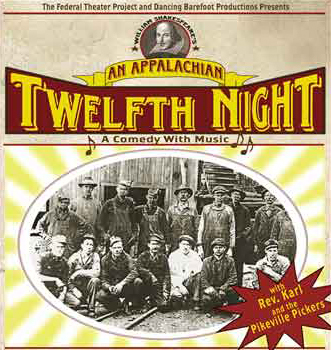 An Appalachian Twelfth Night is a story of loss, love, chaos, laughter and music. 134 West was part of the premiere production in 2002 with Dancing Barefoot Productions and is ready to bring this amazing production to new theaters looking for an accessible Shakespeare show for the whole family. The original production charmed LA audiences with foot-stompin’ fun, sold out shows and rave reviews. – A Los Angeles Drama Critics Circle Nominee for best musical direction. Robert L. Williams’ original adaptation of Shakespeare’s “play with music” stunned and delighted Los Angeles audiences aligning rich, traditional mountain music with the poetry of Shakespearean verse. Setting Shakespeare’s Twelfth Night in an isolated coal-mining town in the thirties, it incorporates an Appalachian band “Rev. Karl and the Pikeville Pickers” and draws from the traditional folk music handed down from the Elizabethan ancestors of the mountain dwellers. Check out the original cast recording on CDBaby or iTunes. Contact susan @ 134west.biz for more information.